73-4. Football League Review 834. 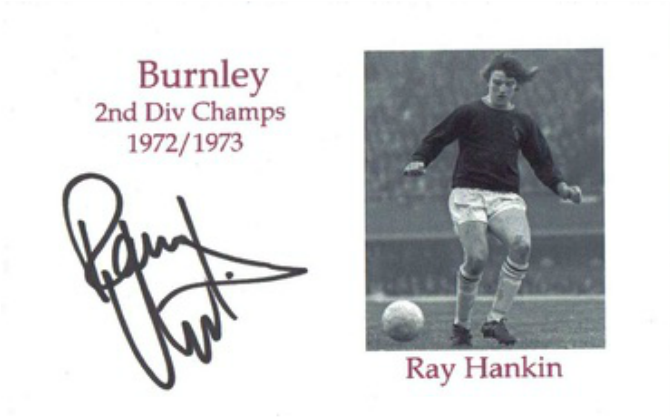 Signature of Ray, while with Burnley, in a game versus Coventry, August 31st, 1974. Game ended 3-0. My letter to Alan Swann, reporter on the Peterborough Telegraph, in response to his remark comparing Kevin Davies' disciplinary record and Ray's, thus concluding that on that basis Ray could've been picked for England! I read your article in the Peterborough Telegraph, a light hearted look at sport in general, and couldn't resist making a reply about your comment towards Ray Hankin! I have created a web page as a sort of tribute in-order to detail all of his qualities and achievements for younger fans to read because I feel that he was unique, in that, he was capable of sheer brilliance on the field,e.g. his goals and renowned flicks could turn a game once thought lost but then his over commitment, which always swung between this and going too far,e.g. receiving a red card, would cause some fans to view his motives as thuggish, selfish by letting down the team and ,like you, as a player who didn't take the game too seriously? Please take a look at my free web page, which doesn't advertise any product, to decide if this then changes your opinions of Ray Hankin! 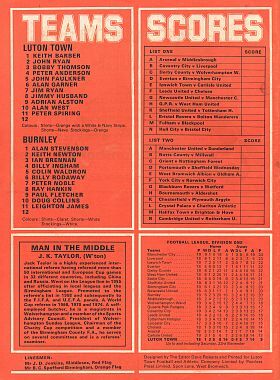 A youth team match day programme when Ray was still an apprentice professional. Graham Moseley later played for Brighton in the 1983 Cup Final. Reverse side of above team sheet. 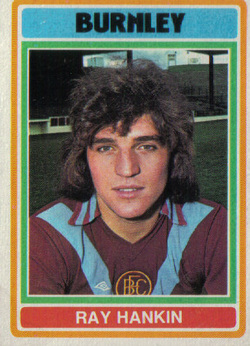 Ray Hankin was born on the 21st February, 1956 in Wallsend Northumberland and attended the Willington High School. The Wallsend Boys Club is situated nearby-North Tyneside-and this is where Ray first began to learn about the game he would eventually become a professional at! 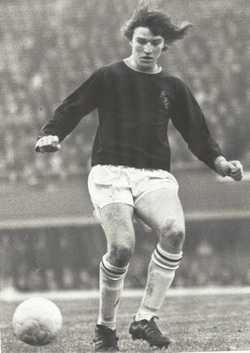 He turned pro, from youth, in february 1973 and made his senior Burnley debut in a home game against Luton Town, 24th April 1973, as a sub who replaced Frank Casper. His last game was away to carlisle on 18th September, 1976. His complete league and Cup appearances for 'The Clarets': 136 games and 46 goals. Ray's nephew Glen Hankin: It's nice that people still remember him. I used to get to go and see him playing when he was at Burnley and Leeds quite often. I remember being in the players lounge up here at Newcastle when they played Leeds in about 1978. I was only 8 at the time and didn't really appreciate the how special that was". 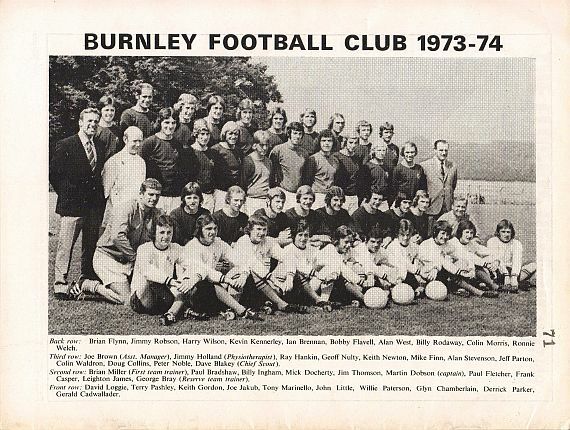 Claretproud on Burnley forum: I was at a Jimmy Mclroy's dinner last year and Ray Hankin was there with his Mrs.I went up to him and as I got closer to where he was sitting I thought, "He's a big fella! "Anyway I said, "Ray, would you mind signing this photo please?" He gave me a long stare and replied: "i'll tell you what I would mind!" I thought,whats he going to say? He said " I would mind if you didn't ask me !! Give me that photo fella" What a top man !! Ray's debut: 24th Apr 1973. Burnley 3 - 0 Luton Town; Goalscorers: James, Thompson, Collins. Att 17,708. FKS - 1974/75 SOCCER STARS CARD. The scout who discovered Ray. 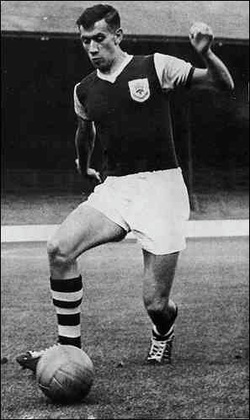 Jack Hixon, from Whitley Bay, was the scout who found many great players, including Ray Hankin for Burnley; He died aged aged 88, on Dec 20th 2009, in hospital. 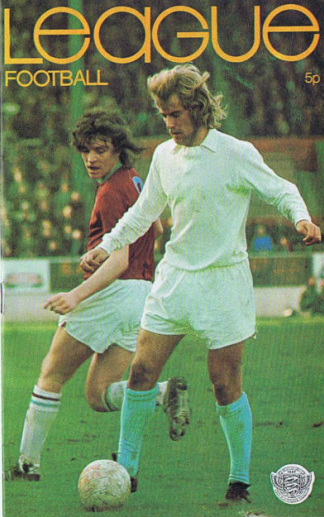 Jimmy Adamson managed Ray, at Burnley, between 1970 until 1976 and then at leeds, between 1978-1980, before selling him to the Whitecaps. 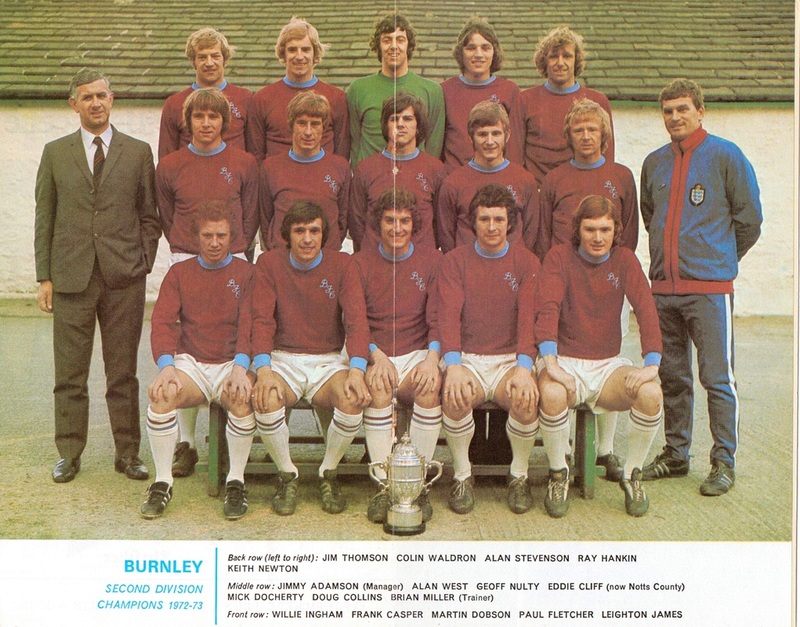 The Burnley 2nd Division winning Championship team of 1972-73; Ray Hankin is on the extreme right and around 17 at this time. 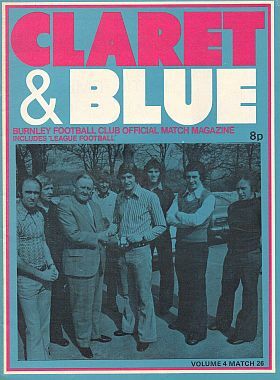 "The Clarets" had already won promotion in their earlier mid week victory at Sunderland but had to now win this "Derby" to secure the second division title as Q.P.R. were still in contention! 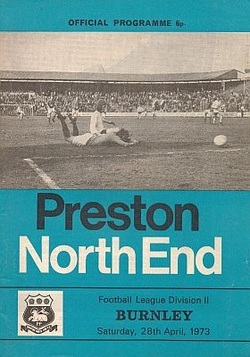 Preston wouldn't lie down as they also required a point to secure their status in the division so a draw would suit both sides, but a bore draw was never considered as the home side narrowed the pitch and watered the centre circle in-order to restrict the attacking prowess of winger Leighton James. Burnley's fans dominated both ends behind each goal as this was evident in the unbroken colour of claret and blue! These fans waited in anticipation of success as they watched the Preston team form a guard of honour in respect to Burnley's promotion success. Gone are the days when the highlight of jeering the opposing team, as they made it on to the field, felt just like a shock goal in the first minute! Preston defended in huge numbers and relied on the long ball in a vain hope to penetrate Burnley's well defended goal. In contrast, "The Clarets" attacked relentlessly and it proved ironic because the first goal came via one of Preston's long balls! Lamb and Billy Ingham battled for such a ball, but with the circumstances slightly favouring the home side, the ball was eventually squared to Bruce who scored from only ten yards. This score remained until half time and the mood among the away support and in the Burnley dressing room must've felt more like confusion as they should've been comfortably in front. News then come through to say that their championship rivals, Rangers, were leading at Fulham so it isn't hard to imagine the feeling that was felt by all in that long twenty minute half time break! If both scores remained the same and "Rangers" managed to defeat Sunderland in their next game then they'd become champs! A Frank Casper throw in found Martin Dobson who hit a scissor kick towards the edge of the Preston box. Colin Waldron got up and won a header but it was headed back out by a Preston defender and back to Waldron. Waldo hit the ball on the volley from some 25 yards out that screamed into the top corner of Kelly’s goal. Deepdale went silent, it was if time had stood still. And then as one the whole place lifted – the noise was incredible and I am certain that those left behind in Burnley heard it. After this, Preston relinquished their attacking ambitions and allowed Burnley to keep the ball as this point was priceless to their survival. There were no more notable opportunities and so the game ended with one set of supporters and players feeling like they'd become millionaires in an instant; In contrast, Preston's faithful just felt sheer relief as another year in Division two was assured! NEVER AGAIN WOULD A SINGLE POINT CREATE SUCH EMOTION SIMULTANEOUSLY IN TWO GREAT TOWNS! The Preston team form a guard of honour in respect to Burnley's promotion success in 1973. Promotion! Ray was a non playing sub. 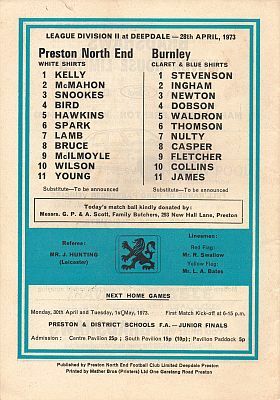 28th Apr 1973 Preston North End 1 - 1 Burnley Goalscorer: Waldron; Att 21,550. ‎'Get Off the Pitch!' Burnley fans flood the Deepdale pitch in 1973. Donated by Mark Cripps; Lees, Lancashire. 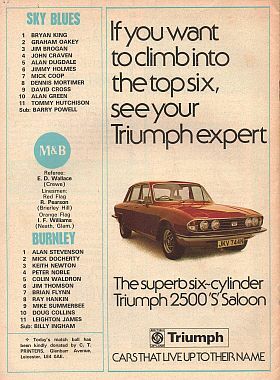 Burnley were crowned champs, winning the league by one point and above Q.P.R. 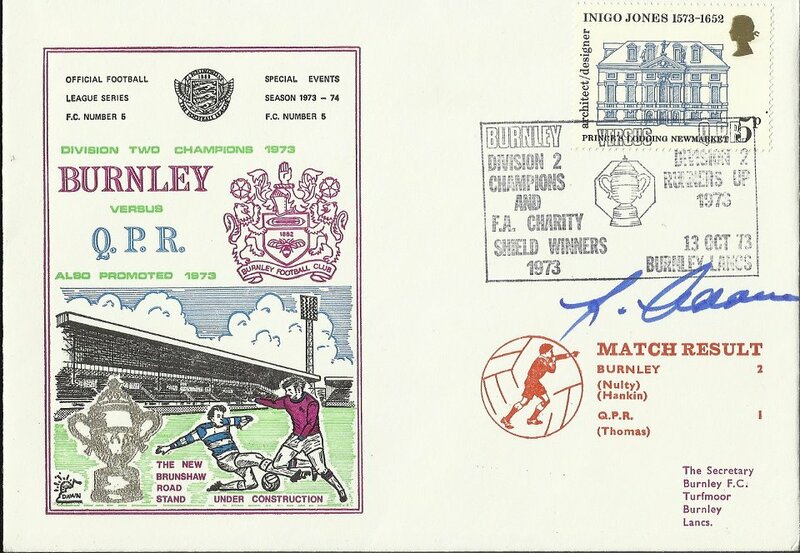 First day cover, commemorating the promotion of both teams to Division One and which has been signed by the manager, Jimmy Adamson. Only 250 were made! 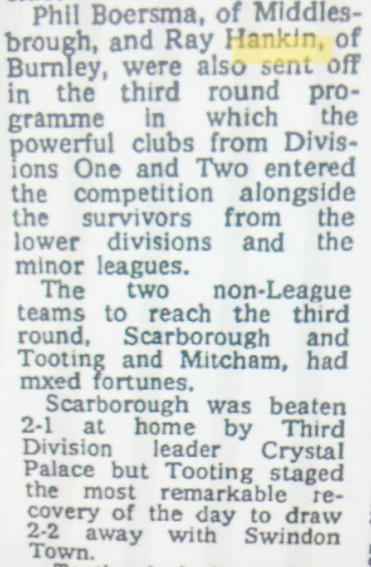 Back in Division One: 1973-74. 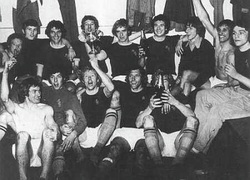 This picture is from the 1973/74 season back in Division 1 in which the team finished 6th and made the semi Final of the F.A. Cup against Newcastle. Ray made 45 appearances in all competitions and scored 15 goals. During this time he gained 3 England under 23 caps to add to his youth honours. Ray getting into a battle with England's Colin Bell! 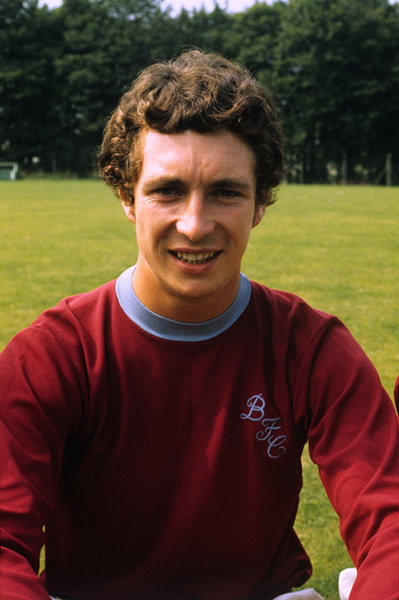 ‎Another profile picture of Ray in Burnley kit, the club where he became the most exciting striker in English football since Jimmy Greaves! He was also part of their F.A. Cup semi final team in '74 and community shield winner in 1973! He later moved to Leeds for a huge fee and all of this was accomplished before he had turned 20! Charity Shield Winners in 1973. 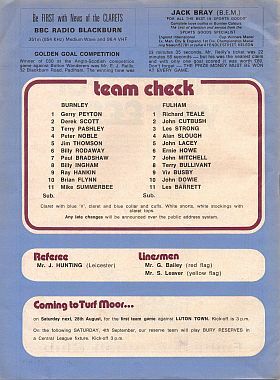 The 1973 Charity shield should have been played between Sunderland and Liverpool, but back then the competition was not perceived to be that glamorous so both teams decided to opt out, Man City had won the comp in 1972 so were invited to play again and Burnley being 2nd Division champs were also invited. 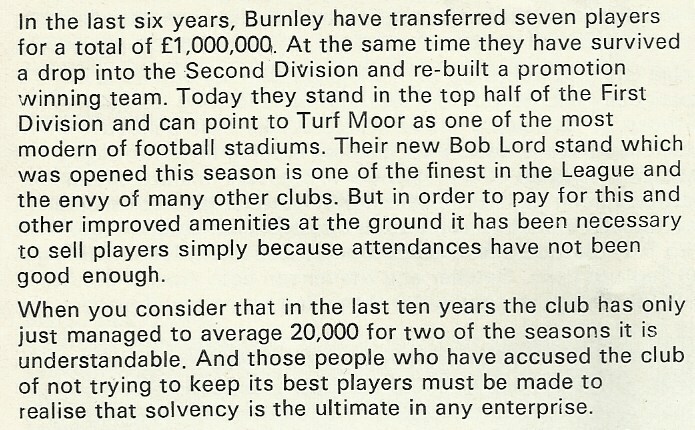 Funnily enough I seem to remember the season after Leeds and Liverpool were originally asked but refused so Burnley as holders were invited to play again, then the FA stepped in and moved the venue to Wembley, so immediately Leeds and Liverpool then decided to play leaving us out in the cold. 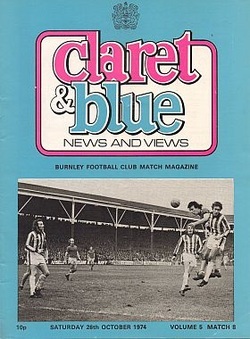 The game finished 1-0 to the "Clarets". Venue: Maine Road, Manchester City F.C. The Charity Shield hit something of a low-point with both the 1972/73 League champions (Liverpool) and FA Cup winners (Sunderland) not taking part in the new-season curtain raiser. Manchester City, who finished mid-table in the First Division, took on Second Division champions Burnley. It was the last match staged at a League ground with the match moving to Wembley the following season in a bid to regain its importance in the calendar. 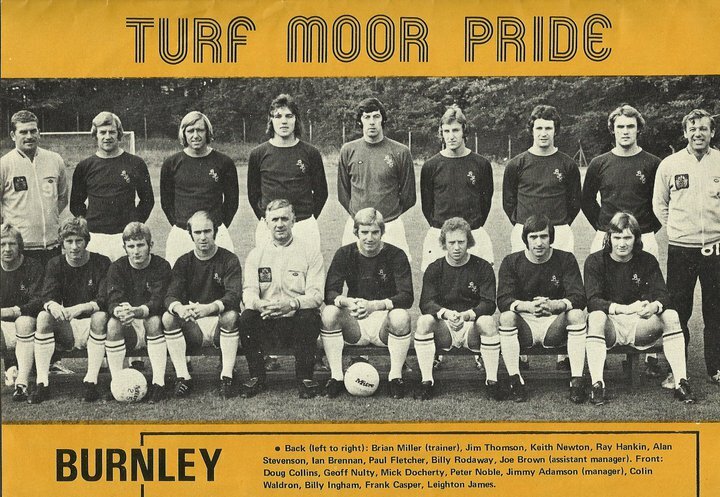 Burnley: A Stevenson, M Docherty, K Newton, J Dobson, C Waldron, J Thomson, G Nulty, F Casper, P Fletcher, J Collins, L James. Substitute: Peter Noble. Manchester City: J Corrigan, T Book, W Donachie, M Doyle, T Booth, A Oakes, M Summerbee, C Bell, D Law, F Lee, R Marsh. 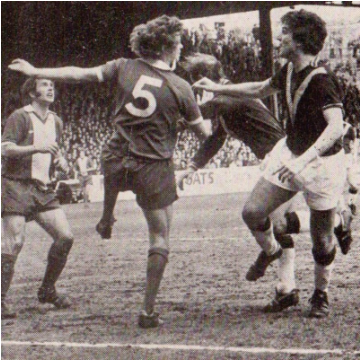 Ray's first goal for Burnley as a seventeen year old! Ray heads home a Leighton James cross. Frank Casper had been injured during the previous match with Spurs- in a planned assault by the Tottenham players -so Paul Fletcher, who had missed that game through injury, came in for Casper and played alongside Hankin for the first time. Burnley defended themselves and it was only Kevin hector who them any real problems. 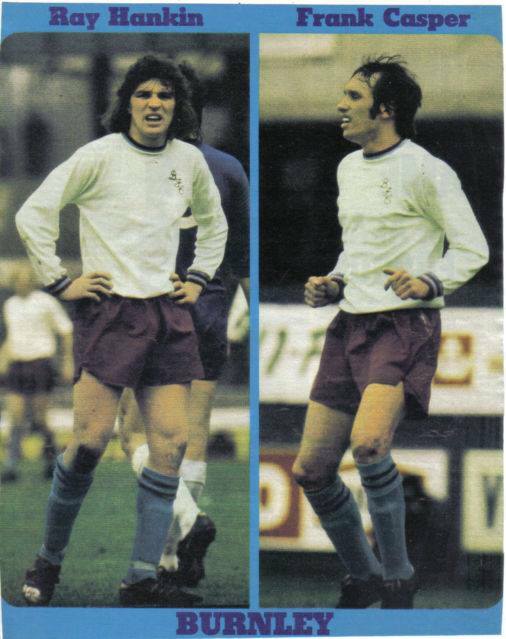 Jim Thompson was in fine form and peter Noble had his best game yet, providing Burnley with great attacking options with his runs down the right wing. 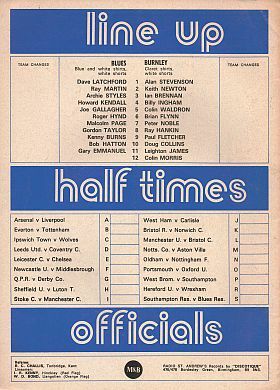 With Leighton James causing problems down the left were able to put Derby under some pressure, but both Hankin and Fletcher found tough opponents in Roy McFarland and Colin Todd. Burnley were undoubtedly the better side in the first half hour but the game cruelly turned against the Clarets. Martin Dobson had missed a glorious chance to give us the lead with only seven minutes gone, but just past the half hour he prodded home from a Thomson flick on following a James corner. The celebrations were short lived as referee Vic James decided to disallow the goal, claiming a push by Thomson. Manager Adamson said after the game: "The players said it was a good goal, but you expect them to say that. I have no complaints about the decision. Sometimes they go your way, sometimes they don't." Within a minute of the disallowed goal, one that would have seen us go 1-0 up, we found ourselves 1-0 down. Archie Gemmill was sent clear down the left. HIs low centre was dummied by Hector at the near post for DAVIES to come in and fire past Alan Stevenson from ten yards. "The goal came out of the blue, and it knocked us out of our stride for a while," Adamson said. It did and for the rest of the first half and the opening period of the second half we struggled to get back into it. Things could have been worse too had John McGovern not missed a chance. But we slowly, and surely, did get back into the game. James set up Hankin who failed to take advantage and then James came close himself with a snap shot into the side netting. The pair weren't to be denied and with 17 minutes remaining they combined to bring Burnley level. James had certainly got the better of Ron Webster and he beat him yet again. This time he crossed perfectly for HANKIN to run in and give Colin Boulton no chance with a downward header for his first ever goal in the first team. New Straits Times - Oct 13, 1973. 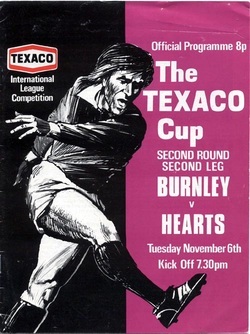 Played in November, at the start of the 1973/74 season, The Texaco Cup was a competition that included English, Scottish and Irish- originally-and was in the form of group stages followed by a straight knock-out! The Anglo-Scottish Cup replaced this later! 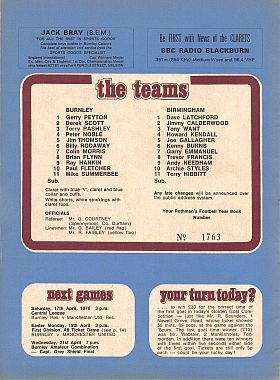 This programme was from a game which ended 5-0 to Burnley, adding to a 3-0 first leg success; Ray Hankin scored twice in this home leg. 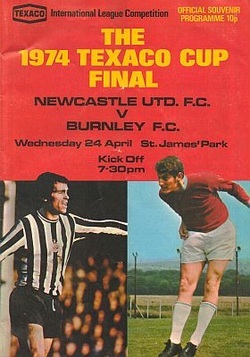 The final was a two-legged match between Burnley and Newcastle. The latter won 2-1 and they would go on to retain their title the following season, against Southampton. The Age - Dec 17, 1973. 5-2 on aggregate to Burnley. 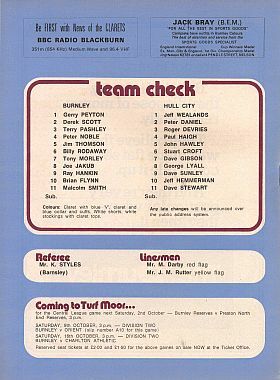 FA Cup 3rd rnd Jan 5th 1974 Grimsby Town 0 - 2 Burnley Goalscorers: Newton, Hankin Att 14,152. Ray's heads in Burnley's second goal against Grimsby. Ablueclaret: Always felt Ray was the most under-rated of our centre-forwards, became a formidable player at Leeds. Both were great in the air.Dave Thomas of course was as good an orthodox winger as I have seen.Not sure if DT was around at the time-but Dobbo was. Malaysia_Mo: Hankin must have lived in digs in the Rosehill area for at least part of his time in Burnley. 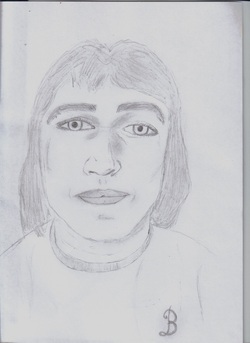 I remember one evening in early November he came over to the bomfire we were building. The bonfire was on some spare ground in the Parklands estate. He was very scared of fireworks - more gentle giant than hard guy. hargy1296: I remember watching Hankin at the turf against 'Boro, Terry Cooper was playing full back and had a rep for being as hard as nails. Cooper was on the ball and Hankin ran over to Cooper and clattered him into the hoardings. Hankin was only a young lad but he made short work of many a defender that season. I was only a kid myself but if I remember rightly Hankin got 19 goals that first season in the old first division, what a player, loved him. ablueclaret: I remember watching Ray playing for the reserves while I stood at the Cricket Road End. He scored many goals by standing in front of the keeper and then side footing the ball into an unguarded net! He got quite a few that season like that. Great player though. Ray Hankin, Dave Thomas, Steve Kindon and Leighton in that 4-5 year period what a team we could have had if we could have hung onto them. Sometimes think Hankin is viewed like Trevor Steven as not having stayed long enough to be a real Claret, but in my eyes a very fine forward and up with the best we've ever had. ClaretandBlue Meanie: Hank the Tank. Hank the Tank! could score with his head from 25 yards. his thighs were thicker than Chris Eagles' waist. gutted when he was sold to dirty Leeds. MaisieDaisy, Burnley Forum: I recall an amusing incident during a tame pre-season game in the 70s at Swindon Town on a warm sunny day. Ray felt agrieved that the ref hadn't awarded him a free kick so he called him a sh*t bag, which was clearly heard by I imagine everyone in the small crowd. The ref, to his credit, used his common sense and just gave Ray a lecture and there were no further problems. 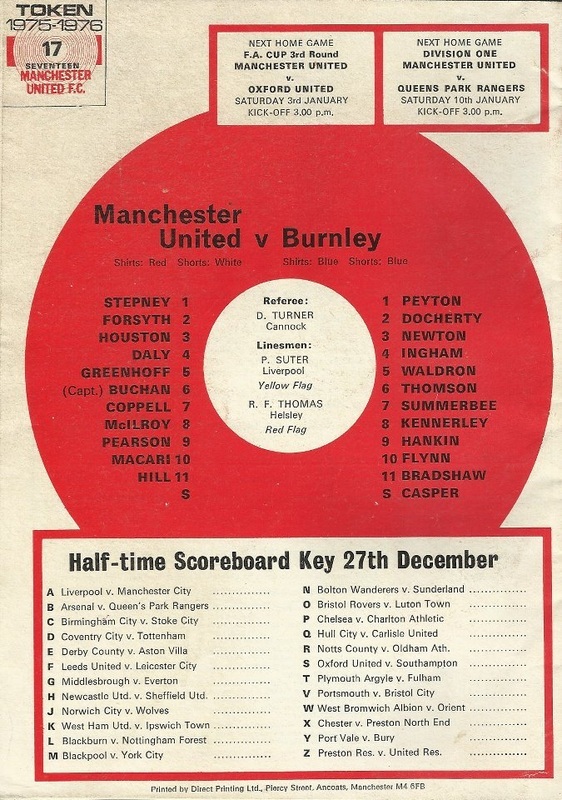 Burnley v Liverpool - 26th December 1973. 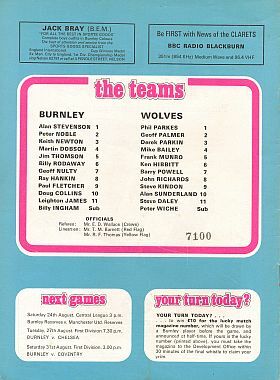 Burnley 1- 2 Sheffield United; Jan 19th 1974. 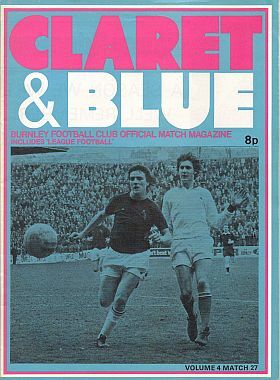 Jan 1st 1974 Coventry City 1 - 1 Burnley Goalscorer: Nulty Att 24,876. 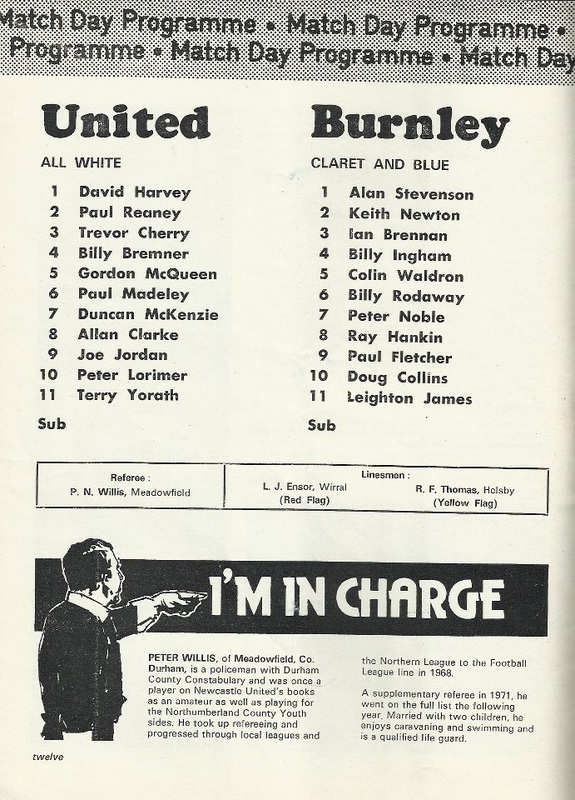 Jan 19th 1974; Burnley 1- 2 Sheffield United. Goalscorer: Hankin; Att 18,878. 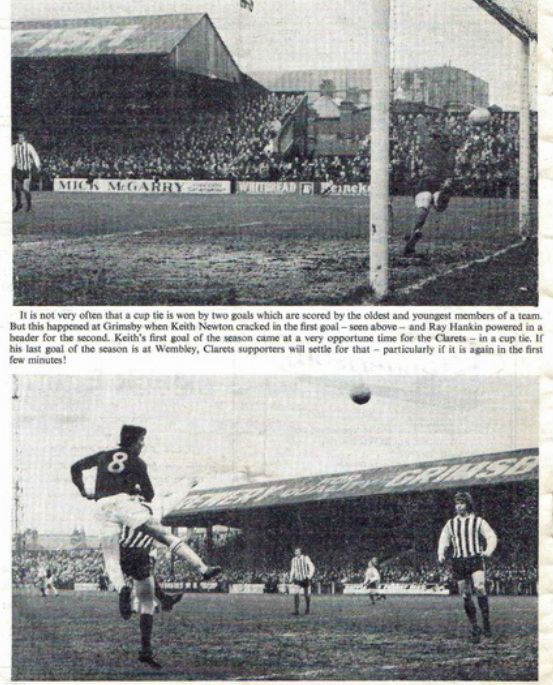 19th January,1974: An equalising goal by Ray Hankin on 52 minutes would cancel out Sheffield United`s 3rd minute opener but it would not be enough and we would eventually lose 2-1 thanks to their winning goal after 73 minutes. We would finish the season in a commendable sixth place with the Blades in mid-table (13th). F.A. Cup Quarter Final, 1974. 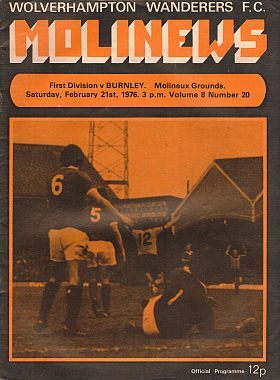 Mar 9th 1974; Burnley 1 - 0 Wrexham. Goalscorer: Casper Att 35,500. This profile was taken from the above programme. 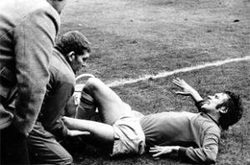 Frank Casper lays in agony after be severely injured by Norman Hunter. During this period, games between Leeds and Burnley were always fierce confrontations and this characteristic describes the intentions of all those players from each team at this time! Following a heated encounter at Elland Road on the 23rd march 1974, when Frank Casper was seriously injured by a Norman Hunter challenge, anger festered all the way through to the start of the next season when Ray Hankin and Gordon McQueen were sent off for fighting, in a 2-1 home win on the 14th September, 1974! 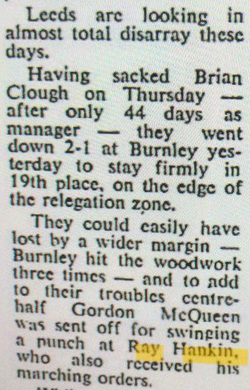 Leeds won the League in 1974 but the tactics that they deployed were criticised then and still today as being "Dirty!" It should be understood that back then it was a far tougher game and each player had to be a real man if they had any hope of surviving! 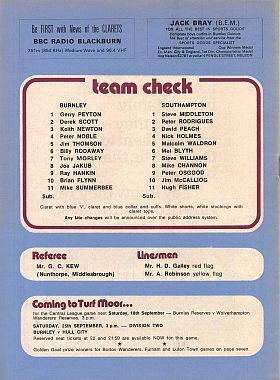 They may be slick athletes today and the game is said to be a lot faster, but ask yourself if any would have a hope in hell of competing against the great Leeds side of the 1970s? 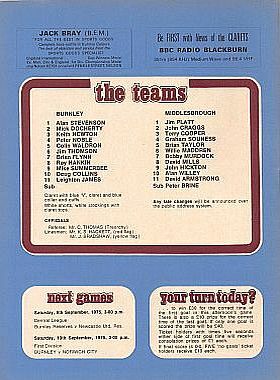 One game that sticks in the mind of both set of supporters and players alike is the game between Leeds and Burnley on 23rd March, 1974 at Elland Road. What occurred here is significant because it had more to do with the feelings of the Chairmen, Managers and players than actually the result of the game! One team had won this game at a canter but were left to face an F.A. Cup Semi Final without their influential captain feeling full fitness; Their rivals had been trounced with the score line but their vile smiles revealed a sinister side of their individual characters. Martin Dobson, Burnley player, once explained that these games created a great atmosphere and fierce rivalry but you had to watch Billy Bremner and Norman Hunter from the front and behind! 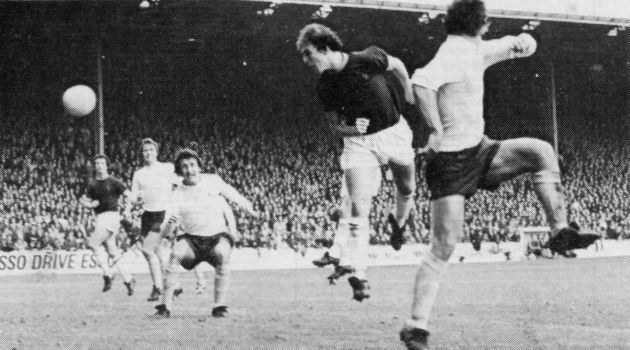 Burnley outclassed Leeds 4-1, where one of their goals, by Paul Fletcher, was actually regarded as being the "Goal of the Decade!" Follow the end link to see this spectacular goal. Leeds were 8 points clear at the top of the league but things weren't going to plan in front of their own faithful, so Norman Hunter decided to release a bit of built up tension that probably was given a seal of approval by all that was white and inside Elland Road that day! Frank Casper, pictured at top, had already released the ball when Hunter challenged and completely took him out. While Casper lay wriggling in agony on the floor, Hunter's face changed from anger to a smile that seemed to say that a job had be well done!Even to this day, Frank can barely talk about this challenge because his career was never the same again and he was unable to do himself justice in that later Semi Final of the Cup! Uwe on the Burnley forum: My favourite was during a typically physical encounter with Dirty Leeds. Ray broke through from about the half-way line, heading towards the Cricket Field. He was going at some speed , with considerable momentum. Gordon McQueen couldn't stop him, other than by pulling his shirt. This caused Ray to spin round. And cracked him one! Bloody marvellous. Both off, I think. Thanks for sending me the Facebook piece you've created for Ray Hankin. Eddie Phillips: watch this and weep Rooney !!! RETRIBUTION: Frank Casper was seriously injured by a Norman Hunter challenge in the previous season's fixture at Elland Road; Anger festered all the way through to the start of the next season when Ray Hankin and Gordon McQueen were sent off for fighting, in a 2-1 home win on the 14th September, 1974! The Sydney Morning Herald - Sep 16, 1974. Leeds United had, the previous week, failed to equal the Clarets’ thirty match unbeaten run of 1920-21, when they lost at Stoke. 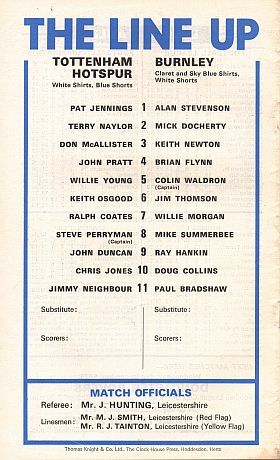 Goals from Paul Fletcher (2), Doug Collins and Geoff Nulty completed a rout of Revie’s men. If only Burnley could repeat this score next week in the semi-final! It was not to be. Perhaps they peaked too early? 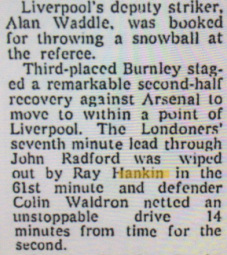 Perhaps the keen young Ray Hankin should have played the whole game instead of the unfit Frank Casper? Who knows? 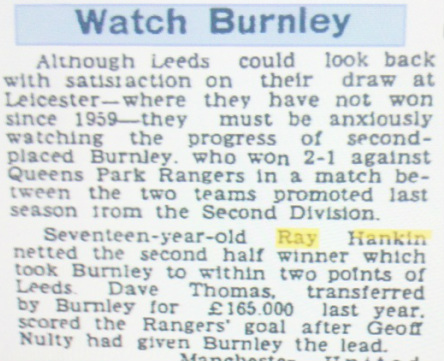 Leighton James confidently predicted a 2-0 win for Burnley. Instead, Malcolm MacDonald scored two goals to give the Magpies a 2-0 victory in front of a crowd of 55,000. 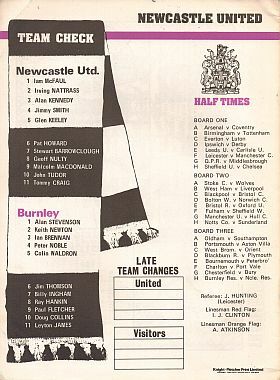 To make matters worse, Newcastle also beat the Clarets in the Texaco Cup Final, and yet on April 10th, Burnley went to St. James’ Park for a league game and goals from Martin Dobson and Geoff Nulty gave the Clarets a 2-1 win. 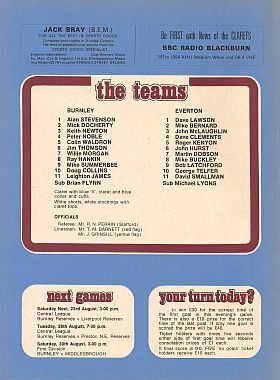 There was some consolation in that Burnley won the third place play-off with Leicester City at Filbert Street, with Ray Hankin scoring the only goal of the game. Cup Semi Final ticket from the game between Burnley and Newcastle of 1974, kindly donated by Richard Letts who has a numerous amount of interesting football memorabilia! I also remember - can't recall the opponents - he was doing the old-fashioned centre-forward thing of standing in front of the keeper, blocking his kick. As the keeper finally shimmied to one side, Ray turned his back. The keeper hoofed the ball against his not inconsiderable backside. It rebounded goalwards, so Ray tapped it in......and got booked. Goal disallowed. 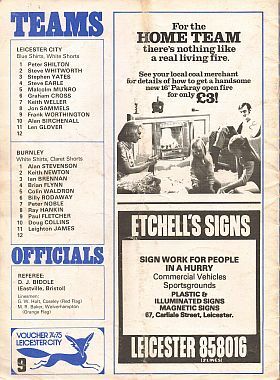 And I do remember him taking care of Bruce Rioch, who had decided to pick on little Flynny. Right in front of the Longside, that one. Oh, by the way. He was also a hell of a footballer. IanMcL: My Hankin moment (can't remember the opposition) was a time with his back to goal and a defender up his bum, he took the ball on his foot, tapped it over his and the defenders head and turned, got round the defender and volleyed it into the net. I think he was about 17 or 18 at the time and showed all the class of a future England Centre Forward. morganonethewig: I think I am right in saying that he was an England youth international before he played for the Clarets first team. I recall reading about him in some of the games he palyed on a European tour ( a sort of youth world cup,) and the newspaper report said that none of the defenders he came up against could cope with him, especially his heading ability, as he always got the better of them. On holiday in Florida in 1982 and we noticed that Fort Lauderdale Strikers had a home fixture against Vancouver Whitecaps. Went along to the match to our complete surprise Ray trotted out for the Whitecaps. The game ended in a draw after 90 mins and went into "overtime", but I can't remember if Ray was on the scoresheet.MarvinsvanL: Shared a couple of pints with the legend, Mr Hankin when he was the head bar man at The Royal Station hotel , Newcastle, around 1995 ish. Lovely man.WestmerciaClaret: I used to go out around Duke Bar with the late Billy Ingham and he once told me about when Hank signed for Leeds. Not long after he had signed he was out on the lash in his brand new Jag with a few footballer mates. Police pulled him over because he was driving erratically. Hank got out of the car and did the " don't you know who I am?" routine to one of the coppers. He then attempted lean against the car, missed it by a mile and went down like a sack of sh**te at the side of the car and duly got arrested. The way Billy told this tale was pure quality! Ray powers in with a header and is about to break the net in a game versus Coventry, August 31st, 1974; Game ended 3-0. Ray celebrating his goal above. Ray looks on as Peter Noble scores against Coventry; Game ended 3-0, with further goals from Hankin and James. August 31st, 1974. 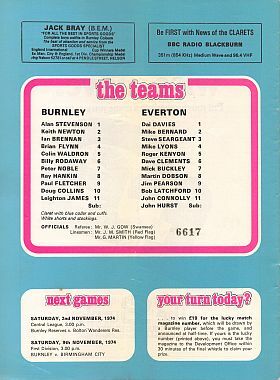 Burnley v Everton - 26th October 1974. League Division One. November 2nd, 1974. 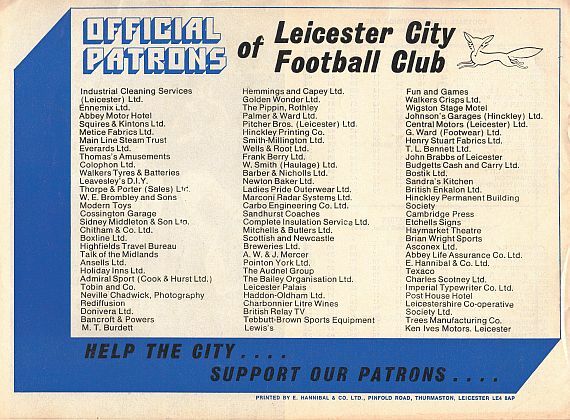 This game ended in a 1-0 defeat to Leicester at Filbert Street. Leighton James, Ian Brennan, Colin Waldron and Ray Hankin were all denied by the then young and brilliant Mark Wallington! Ray looks on and hopes that the ball drops! Their keeper was in such great form that, maybe, Ray should've shoulder barged him into the net! It used to work during the 1950's! 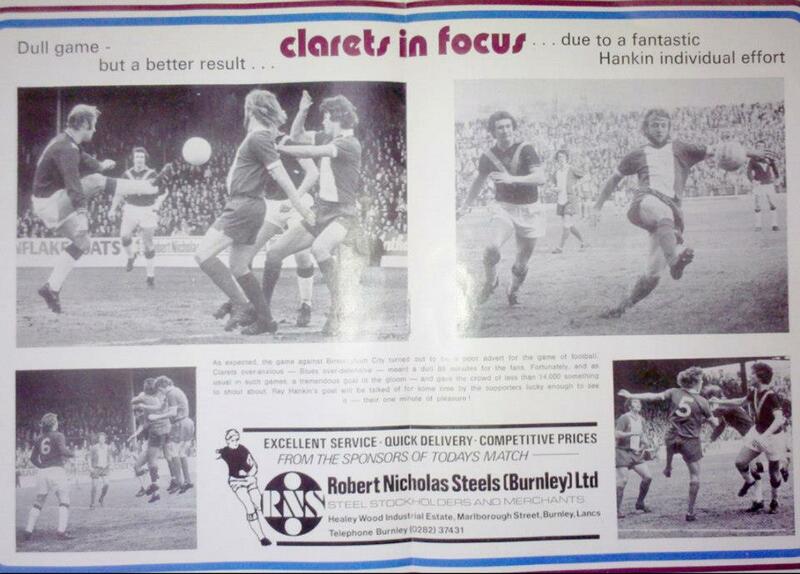 garfunkal-Burnley football forum:"Big Ray always scored against Birmingham!" Ray hitting the back of "Brums" net again! 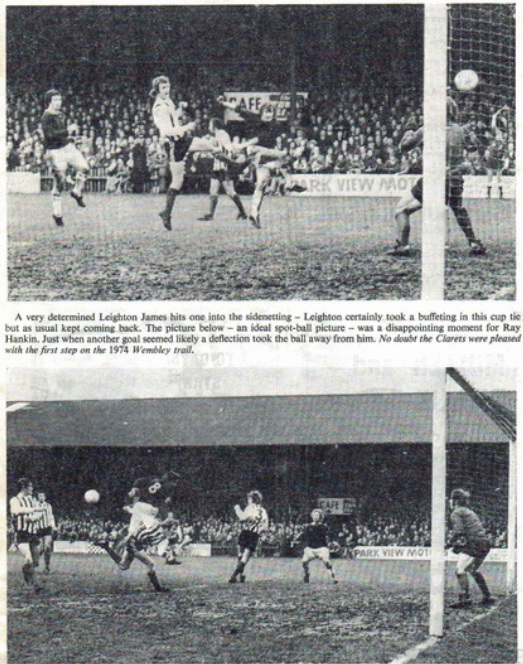 Feb 1st, 1975; Ray heads home the equaliser, from a James cross, versus Birmingham at St Andrews. Ray replaced Johnson as a sub. 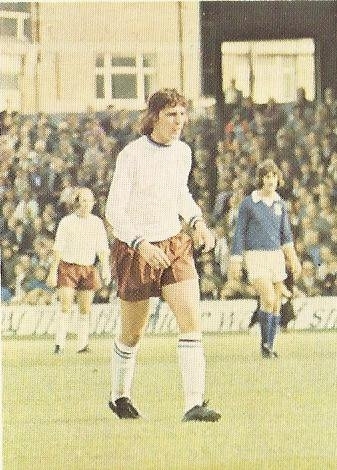 Handed his debut at The Dell against Southampton in April 1972 at the age of just 17, a glittering United career lie in prospect for Peter Hampton, recipient of several England youth caps, while representing his country in a mini-Under-18s World Cup, playing alongside the likes of future Elland Road team-mate Ray Hankin and Tony Morley. Ray was part of the England youth team which won the 1973 European Championships which was held in Italy. The final score was England 3-2 East Germany. Tony Waiters managed this side and later signed him for the Vancouver Whitecaps. Ray was part of the England youth team which won the 1973 European Championships. The finals were held in Italy, with England beating East Germany 3-2, after extra-time, in the final. England won Group C by defeating Iceland 2-0, Switzerland 2-0 and drawing 0-0 with Belgium. England then beat the hosts Italy 1-0 in the Semi Final and Hankin was replaced in the final by substitute Andrew Impey. Tony Waiters managed this side and later signed him for the Vancouver Whitecaps. Scorers: Denis Tueart 2; Steve Whitworth. Scorers: Kevin Beattie 27', David Johnson 68'. 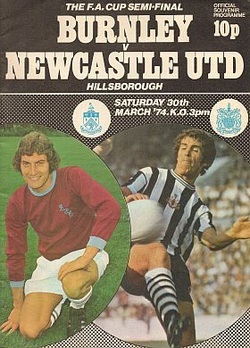 February 15th, 1975: Newcastle 3 Burnley 0. 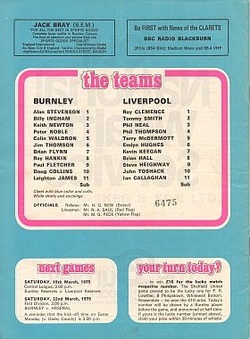 Mar 8th 1975; Burnley 1 - 1 Liverpool. Goalscorer: Hankin. Att 32,11.
wardlewarrior-Burnley forum: I have memories of certain goals and certain players and when I think of Ray Hankin I always think of him scoring a goal against Liverpool in a First division match at Turf Moor in the 1974-75 season.Burnley took the lead with the goal, a powerful downward header that went under the diving body of Ray Clemence, hit the ground and bounced up with force into the top of the net. Me and my mates were stood just behind the nets in the Bee Hole End.Terry McDermott scored for Liverpool to deny us a win against what was a very good Liverpool side. Big crowd that day as well 31,812. Mar 22nd; 1975: Burnley 3 - 3 Arsenal. Goalscorers: Noble Hankin, James. 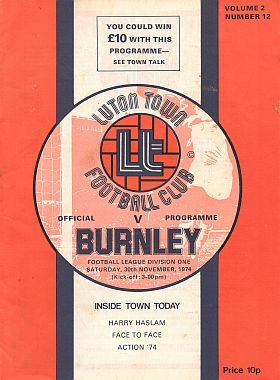 Att 17,800.
garfunkal on Burnley forum: Big Ray always scored against Birmingham:My memory was in a game against Arsenal and the ref who had give us nothing all game gave us a penalty for nothing Ray couldn't believe it and ran up to us saying this idiot give a penalty for f all and he couldn't stop laughing think the game finished 3-3. ClaretTony: The referee apologised after the game, (3-3 draw v Arsenal), for missing the clearest of penalties for a foul on Keith Newton. Can't remember who it was though.As for Hankin - looked to have so much promise as a youngster and I think it is fair to say he never achieved as much as most people expected him to. A and BC trading card; 1974/75 team Picture. 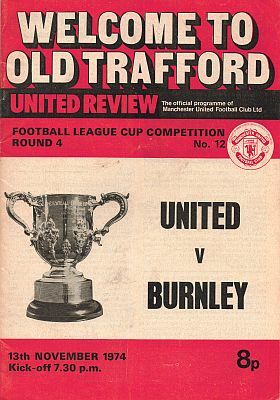 Ray Hankin gave us a first half lead, United came back to win the game 2-1. The win for United took them to second place, behind leaders Liverpool on goal average. 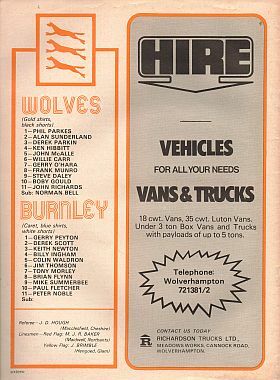 We dropped into the bottom three along with Wolves and Sheffield United. 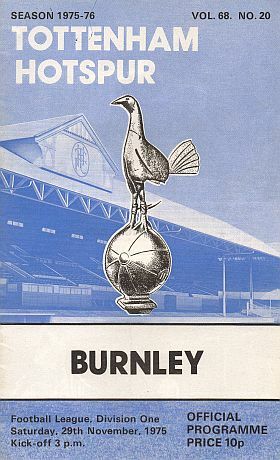 Nov 29th 1975 Tottenham Hotspur 2 - 1 Burnley Goalscorer: Hankin. This was too much. We started well. 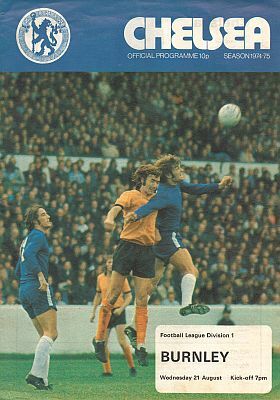 Midway through the first half, Ray Hankin scrambled us into the lead after Pat Jennings and his defenders had got their wires crossed. We seemed capable of holding our advantage, too. Even Ralph Coates couldn’t get Spurs going and with Paul Fletcher complementing Hankin’s aerial power, Willie Young and Co were given a difficult time. Then before the interval we lost two players to injury. Doug Collins was thought to have suffered a second leg fracture (he hadn’t) and Paul Bradshaw replaced him. Shortly afterwards, Willie Morgan was carried off. Even insipid Spurs with their poor home record were able to make the numerical advantage count (only one substitute was allowed then). Duncan buried two chances, leaving us to chalk up our fifth League defeat in a row. Thank God November was over. 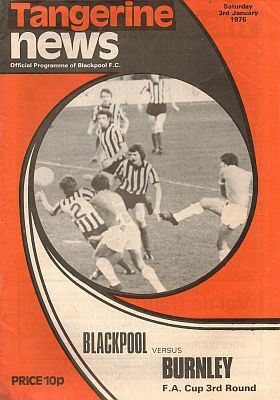 03/01/1976; Blackpool v Burnley, [FA Cup]. The Age - Jan 5, 1976. 75/76 season, Topps Chewing Gum Card. 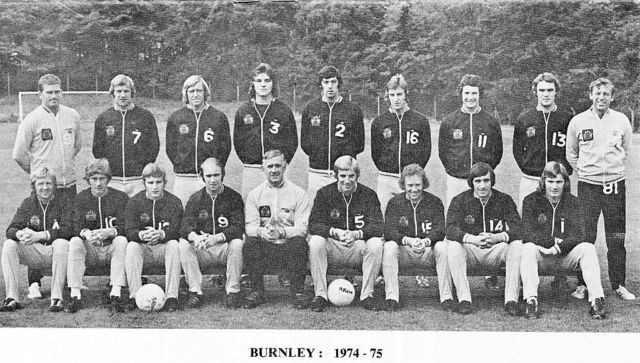 Joe Brown took over at Burnley after Jimmy Adamson had been sacked in 1976 and sold Ray to Leeds. 1975/76 season ended with a change of manager: Jimmy Adamson to Joe brown and relegation to Division 2. A few players left the club during the following season, including Ray, who made 10 appearances and scoring 2 goals before his move to Leeds United, in September '76, for a fee of £180,000. 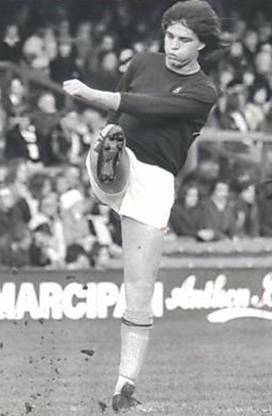 Ray's total Burnley goals and appearances were: 129, 42 goals.Burnley had sunk to 20th place by the time the FA Cup third round match against Blackpool came up on 3rd March, 1976. 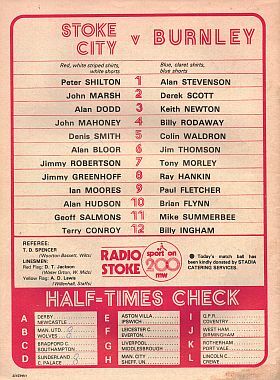 An inept display saw the Second Division side win 1-0, with Ray Hankin sent off. 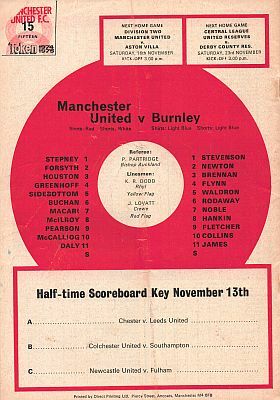 This was to be Jimmy Adamson's final match as Burnley manager, and the following week assistant Joe Brown was promoted to take charge of the team. 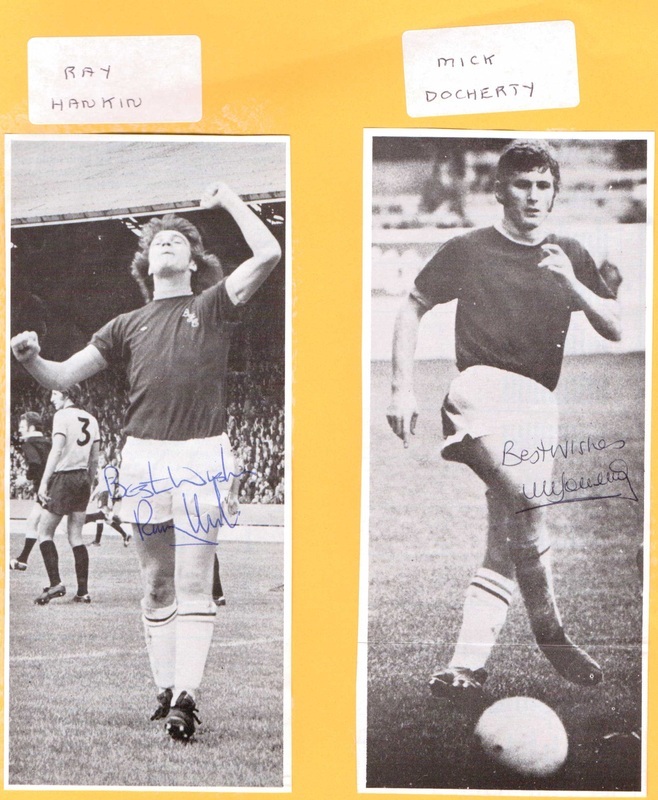 Brown's first match was at Norwich with a much changed side, and this was the last game in Burnley colours, coincidentally, for both Frank Casper(right) and Mick Docherty. In an attempt to stave off the inevitable, under23 international Tony Morley was signed from Preston North End in February. Morley was to go on to championship and European Cup success with Aston Villa, but his impact at Turf Moor was disappointing. 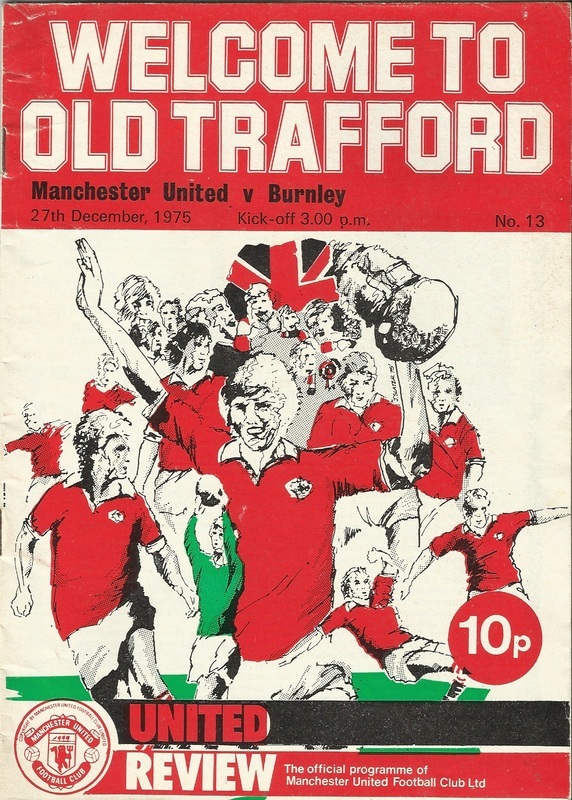 Wins against Birmingham and Newcastle in April kept hope alive, but the inevitable blow fell when Turf Moors biggest crowd of the season, 27.411 saw Manchester United win 1-0 on Easter Monday. So it was back to Division Two.the way back this time would not be so easy. 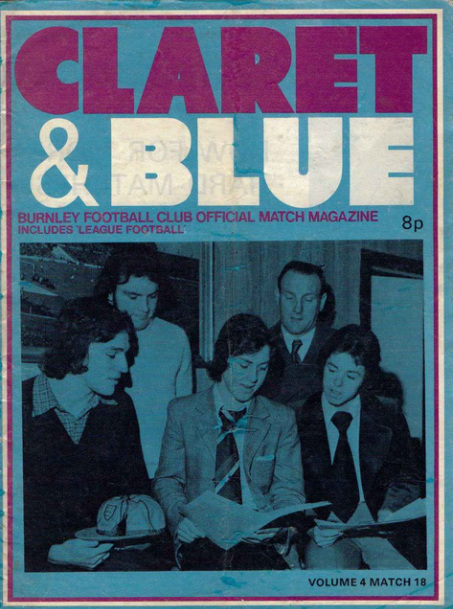 Burnley's league game at Stoke came on 6th March 1976. We were third from bottom of the league with nine games to go but this one did nothing for our chances. 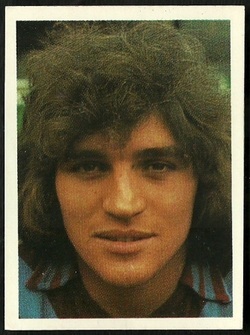 Ray Hankin scored for Burnley on 37 minutes but by then Stoke had already found the net three times. They added another in the second half and it ended 4-1. 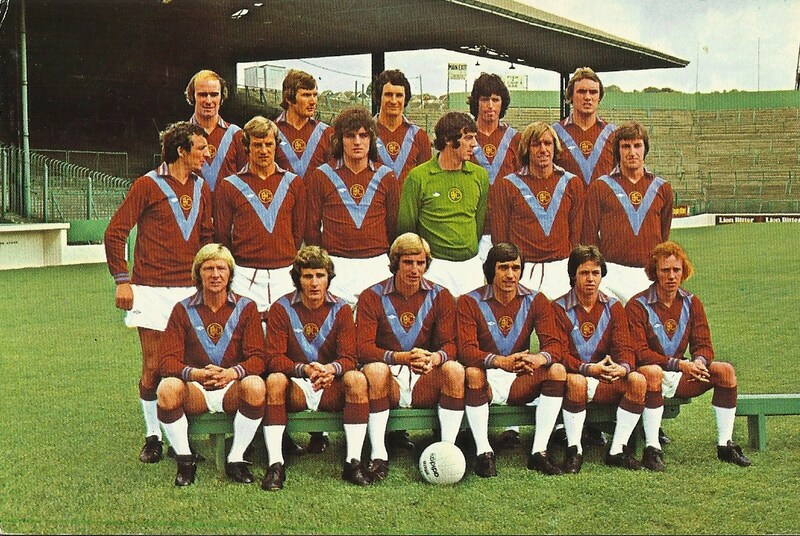 The Burnley team was: Gerry Peyton, Derek Scott, Keith Newton, Billy Rodaway (Tony Morley), Colin Waldron, Jim Thomson, Colin Morris, Ray Hankin, Paul Fletcher, Brian Flynn, Mike Summerbee. Ray takes advantage of a mix up inside the Stoke penalty area to score his eleventh goal of the season- but all to no avail! A well known face attempts to scoop up the ball! Ray waits to pick up a loose ball! Ray threatens the Stoke goal! 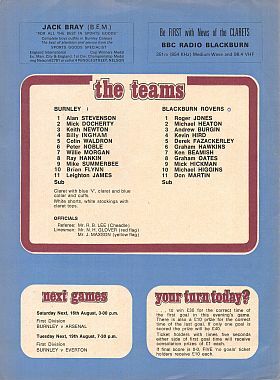 Burnley versus B'Ham; 10th April, 1976. A dull game for 89 minutes was lit up with a tremendous individual effort from Ray! One, that will be talked of for some time by supporters, luckily enough to have seen it- their one minute of pleasure! 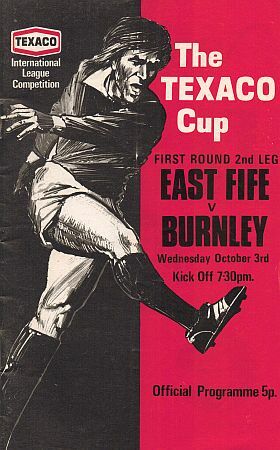 The Anglo Scottish Cup replaced the Texaco Cup. Burnley finished third in their group and were eliminated at this stage. Ray left Burnley one month later and signed for Leeds. Ray's Last Game For Burnley. Carlisle United 2 - 1 Burnley.